Extreme is our highest grade concentrate line marking paint, with extra pigments and binders to ensure it not only stands out on the pitch, but is also very durable and weather-resistant. This makes Extreme a very popular choice for winter sports like football or rugby. Extreme is a particularly versatile paint as it is designed to be used through any spray or wheel-to-wheel marker. It needs to be mixed thoroughly with water at ratios of up to 7:1. We recommend using no more than 2 to 3 litres of Extreme mixed with water for a football pitch, with either a yellow (020) or green (015) flat fan nozzle. Avoid using nozzles like the blue (030) which put too much liquid on the grass. If you’re not sure which nozzle is right for you, give our friendly team a call and we’ll help you out. 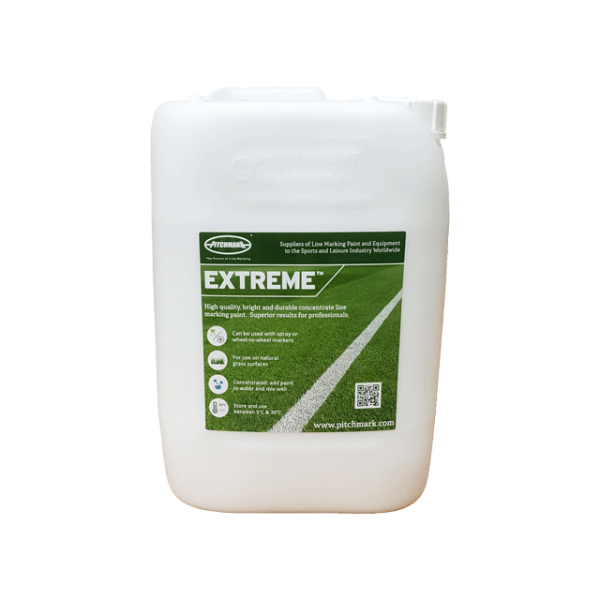 Popular in 10L bottles, Extreme is also supplied in 750L IBC’s which grounds maintenance contractors and councils find very useful when marking out multiple pitches. For use on natural grass surfaces like football pitches, rugby pitches or running tracks. Designed for use with any spray line marker when diluted to the appropriate ratio. Also works perfectly through a transfer wheel-to-wheel line marker when mixed at a lower ratio. Concentrate, dilute with water and mix thoroughly before use.